Dec 28, 2016: How's my build look? Dec 30, 2016: Finished Build, Looking for you guys to check it! Dec 30, 2016: Is this a good gaming build? Jan 03, 2017: Want to upgrade gtx 750 to a 1060. Little guidance please. Jan 03, 2017: Silverstone sugo sgb13 build parts list? Jan 24, 2017: Will this work? Jan 26, 2017: [Build Help] Questions regarding upgrades to my computer? Jan 26, 2017: Help with upgrading my older prebuilt computer? Feb 13, 2017: can my PSU support this GPU? Feb 16, 2017: Is this build compatible? Feb 16, 2017: Is this build compatible? Any comments? Feb 18, 2017: Quick question about compatibility. Feb 19, 2017: USB disconnect/reconnect issue. I've tried everything. Feb 21, 2017: [Build Help] First time PC builder. Looking for some feedback on this parts list and have several questions at the end. Feb 23, 2017: Will I be okay with this Power Supply? Feb 26, 2017: Will I be alright with this Power Supply? Mar 01, 2017: First time building a pc, will these parts work together and what games will it be able to run? Mar 15, 2017: Looking for power supply upgrade reccomendations. Apr 21, 2017: First PC Build, is this good? Apr 28, 2017: Need advice on upgrading GPU, Concerned about power supply / knowing if i have 6 / 8 pin connectors. Any Advice would be greatly appreciated. May 02, 2017: Need a double check to make sure I didn't goof. May 08, 2017: Upgrading A Computer From Bestbuy. May 11, 2017: antminer s7 power supply issue. May 30, 2017: A first build that I'm very interested in making, looking for some expert insight. Jun 04, 2017: Run your robot off wall power! Jun 13, 2017: [Build Help] Helping my friend upgrade his PC, everything is installed but won't post. Jun 22, 2017: How do I know if my brothers parts will work together with no bottleneck? Jun 26, 2017: GPU/Graphics Card choice. Jul 05, 2017: First build ever. Ready to buy! Jul 28, 2017: Will this Graphics card fit in my PC? Jul 28, 2017: Will my computer handle this? Jul 29, 2017: Is It Safe To Use This PSU As A Temporary Solution? Aug 06, 2017: Is This A Good Build? Aug 10, 2017: Productivity workstation, Linux Mint 18, Four monitors, one GPU. Opinions needed. Aug 24, 2017: Judge my budget build? Aug 26, 2017: 500W PSU good enough for R9 390? Aug 27, 2017: Suggested build for GoPro Editing/Casual Gaming PC! Sep 09, 2017: EVGA 500w vs Corsair CSM 550? Sep 15, 2017: Putting together a Computer - Thoughts? Sep 15, 2017: Is this overkill? Sep 16, 2017: Is this any good for a budget gamin pc with upgradability? Sep 16, 2017: First time build, Any advice or suggestions would be great. Sep 21, 2017: GTX 1080 on 500w PSU? Sep 25, 2017: Rate this potential build? Oct 20, 2017: Can I Overclock My GPU With This PSU? Nov 05, 2017: Im building My First PC Please help! Nov 19, 2017: CPU or GPU Upgrade? Nov 28, 2017: need help with $550ish build! Any advice would be greatly appreciated! Dec 05, 2017: It would be useful if Amazon showed how many times an item had been bought and how many times it had been returned. Dec 09, 2017: Can I use a 500W PSU with a 980 ti + i5 7500? Dec 18, 2017: No clue if these parts are "compatible"
Dec 20, 2017: I upgraded a few parts on a Dell PC and now PC will not boot. Please help diagnose. Dec 31, 2017: Ascending into greatness! Jan 30, 2018: are these parts compatible and/or any good? if not, help would be appreciated. Feb 10, 2018: Is this a good starter build? Feb 11, 2018: Is this a good entry level gaming build? Feb 13, 2018: How can I improve this build? Feb 22, 2018: Building my first gaming pc (which is a budget build) and I need to know if these parts are all compatible with each other. Mar 01, 2018: Building a PC, would like feedback of if parts would work together. Mar 19, 2018: Engineering class Gaming PC Build $650 budget. May 07, 2018: Future Build Help! May 10, 2018: At a total loss with Mobo, CPU or GPU issue. May 26, 2018: What do you guys think of this PC Build? May 29, 2018: Help me make sure i'm not making a big booboo. Jun 12, 2018: Need some advice on my first build. Sep 12, 2018: New PC build has strange periods where computer freezes up, help? Sep 25, 2018: WTF is going on? Need Help. Nov 01, 2018: How can I improve this build? Nov 02, 2018: $600 Dollar PC Build Feedback Please! Nov 23, 2018: Which PSU, Corsair - CX (2017) 550 W 80+ Bronze or EVGA 500 W1, 80+ WHITE 500W? 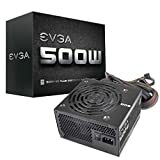 Nov 23, 2018: Is it worth replacing my EVGA 500W PSU with an EVGA 750W G3? Nov 26, 2018: Building a PC for programming with used xeons, any suggestions appreciated! Nov 30, 2018: Playing tech support for a friend after buying them a new AM4 setup to replace their AM2, won't post or create an image, CPU EZ debug light is on. Dec 02, 2018: Desktop Computer Not Booting - Issue Appears to Be CPU or Motherboard. Dec 05, 2018: Use ATX +5Vsb to power always-on board? Dec 30, 2018: I’m a high school student trying to build his first PC! Jan 03, 2019: Good cheap build? Mar 05, 2019: Rx 580 burned out on siege? Mar 12, 2019: Haven't built a PC yet, but these are the parts I'm planning on using. Suggestions? Criticism? Mar 19, 2019: Is this PSU viable for a 1070 + I5-7600k build? Apr 02, 2019: Looking for a graphics card. Apr 15, 2019: Pc wont start!